Citrus Hotel offers modern rooms with flat-screen TVs, located a 5-minute walk from Calangute Beach, North Goa’s largest beach. It has an outdoor pool, spa and free private parking. Rooms at Goa Citrus are equipped with wooden furnishings, Wi-Fi access and air conditioning. They are equipped with a safe and satellite TV. A minibar and tea/coffee making facilities are also provided. Guests scan lounge by the large outdoor pool or exercise at the well-equipped fitness center. Travel arrangements can be made at Citrus’s tour desk. The staff at the 24-hour front desk provide business and concierge services. Citrus Goa has a 24-hour coffee shop which serves Indian and international dishes. Light refreshments and cocktails are available at the poolside bar. Round-the-clock room service is provided. 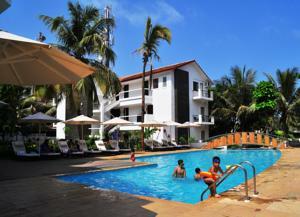 Situated within Goa’s entertainment district, Hotel Citrus is located 25 miles from Goa International Airport. Wi-Fi is available in the hotel rooms and charges apply. Free! All children under 11 years stay free of charge when using existing beds. One older child or adult is charged INR 1042 per night and person in an extra bed. Maximum capacity of extra beds in a room is 1. There is baby beds in a room is 0 capacity for cots in the room. Any type of extra bed or crib is upon request and needs to be confirmed by the hotel. Supplements will not be calculated automatically in the total costs and have to be paid separately in the hotel. Visa, Euro/Mastercard The hotel reserves the right to pre-authorize credit cards prior to arrival.